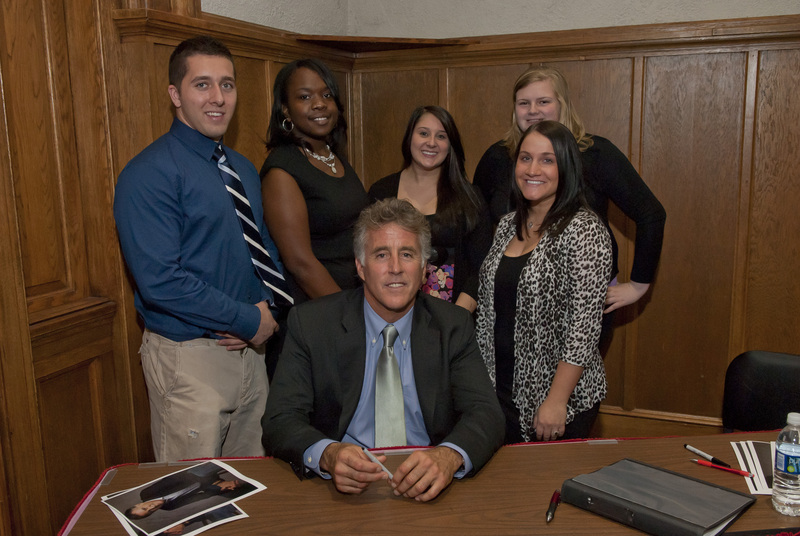 Christopher Kennedy Lawford, son of Peter Lawford and Patricia Kennedy arrived on East Stroudsburg University’s Keystone Room around four o’clock on Tuesday October 26. The well-known author and actor came to the university to give a presentation about addiction and recovery. This presentation was about Lawford’s mishaps with drugs and alcohol as well as his daughter’s. The purpose was to inform students and faculty about the dangers of drugs and alcohol. Also he wanted to provide insight to those who have been directly or indirectly affected over the course of their lives. PRSSA members helped to organize the pre-reception. Under the direction of Public Relations coordinator, Brenda Friday, members were able to learn about setting up and event and being hospitable to visitors. Mr. Lawford even spent some time talking to our students about one of his new plans for work. He asked PRSSA what their opinions were on a website designed for people who have just completed drug or alcohol rehabilitation. The students liked the idea and helped to inform Lawford about what they know about building up an organization and approved of his newly developed plan.